Varitek, Sox Together Again. Officially. Finally, the Varitek saga, which has kept us all hitting “refresh” on google news/Boston Globe/ESPN, whatever, is over. Reports are that Jason Varitek has agreed to the one year , $5 million dollar contract with the club/player options for the second year. All I have to say is hal-le-freaking-lu-jah! Cassel questions and the NFL off-season. Note to Patriots, if you are even listening: half the Baltimore defense are unrestricted free agents this year. Grab as many as you can get your hands on. Please. As for the Cassel/Brady drama…maybe that will be enough to keep me occupied now that the Tek saga is done, and the Sox unlikely to make any more off-season moves. But of course, since its the Patriots, the amount of information we’ll be able to get on the Brady/Cassel situation (how is Tom’s knee, are the Pats keeping Cassel, are they going to tag him…etc) will be slim to none. Thanks for the closed-mouth attitude, Bill. Most days, I don’t mind that, but when you want to know something, the Patriots can be down-right annoying. Back to baseball. Red Sox Nation rejoice, we have a catcher. I know Tek was like an automatic out last season, but its not like there’s anyone out there who can step in and take his place. Now we’ll just ease Tek out of the position, introduce a new catcher, get the staff acclaimated to the new guy, so that we can phase Tek out in 2010. And you never know, he could have a brilliant season in 2009 and bounce back a little. Call me crazy, but it could happen. 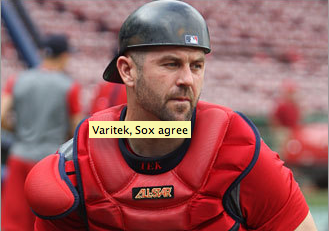 ← Varitek, Sox Together Again. Officially.